Carolina Panthers linebacker Luke Kuechly is the kind of impact player that NFL teams envision when they select a player in the top ten of the NFL Draft. Selected ninth overall in the 2012 NFL Draft, he was named Defensive Rookie of the Year that season and NFL Defensive Player of the Year in 2013. What can he do for an encore in year three? 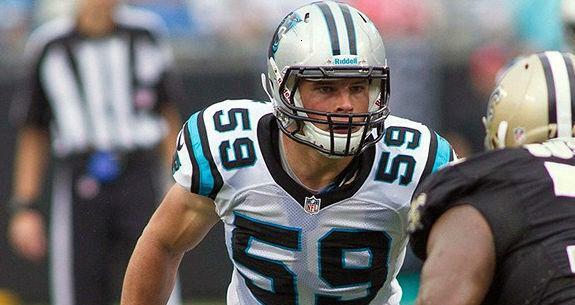 Kuechly’s eyes are set on the Super Bowl. Kuechly’s old-school physical style and “Smelf-confidence” lends itself perfectly to a partnership with old-school icon Old Spice. Talk about the partnership with Old Spice. At every level you’ve played, you’ve been a tackling machine. How do you account for this? What do you do differently? What makes the Panthers defense so physical? Every defense in the league tries to be what you guys are. What’s the secret?